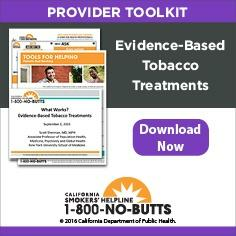 Ever since the California Smokers’ Helpline began in 1992, research has been an important part of its mission. Careful evaluation provides confidence that Helpline services really do help people quit. And it ensures the Helpline is serving people from all walks of life, including those who have less access to other tobacco treatments. Read about the Helpline’s protocols for working with various populations. Read evidence that Helpline services are effective in helping tobacco users quit. Read evidence that the Helpline reaches a diverse audience. "Telephone Counseling for Smoking Cessation: What's in a Call?" Helpline counseling is proven to help people quit using tobacco. This article describes what Helpline counselors discuss with clients and why. It also describes different client situations and how counselors are trained to deal with them. "Putting It on the Line: Telephone Counseling for Adolescent Smokers"
How does the Helpline work with teenagers? This paper describes a telephone counseling program specifically for adolescents who want to quit smoking. It answers questions about how to work with young smokers and the best ways to support them. What is different about helping pregnant smokers quit? This article describes an effective counseling protocol that helps pregnant women develop coping skills and how counselors are trained to understand the unique needs of these clients. "Counselling Asian Smokers: Key Considerations for a Telephone Intervention"
Few studies focus on ways to help Asian language speakers quit smoking. This one describes an effective protocol that helps Chinese, Korean and Vietnamese speakers quit smoking. It also shows that Asian-language callers are just as likely as English-language callers to engage in counseling and be satisfied with the process. "Telephone Counseling for Smoking Cessation: Effects of Single-session and Multiple-session Interventions"
This study with English and Spanish speaking adults showed that a single session of telephone counseling increases quitting success, and that multiple sessions are even more effective. In fact they roughly doubled the odds of callers quitting long-term. "Evidence of Real-World Effectiveness of a Telephone Quitline for Smokers"
Replicating the results of the study above, this one showed that the Helpline maintained effectiveness after being scaled up from a small clinical trial to a real-world setting. Results support calls for greater availability of quitlines. "The Effects of a Multilingual Telephone Quitline for Asian Smokers: A Randomized Controlled Trial"
There was some question whether telephone based “talk therapy” would be as effective for Asian-language speakers as for English and Spanish speakers. This study showed that a quitline for Chinese, Korean, and Vietnamese speaking smokers was indeed effective, doubling their odds of success. "The Demographics of Help-seeking for Smoking Cessation in California and the Role of the California Smokers' Helpline"
This study compares the demographics of Helpline callers to those of California smokers in general. It shows that most racial and ethnic groups and those in both rural and urban locations are well represented among callers. The Helpline model provides accessible smoking cessation service on a statewide scale. "Reaching Young Adult Smokers Through Quitlines"
Young adults are well represented among Helpline callers. That includes women, ethnic minorities, and people with lower income or less education. "Use of a Smokers' Quitline by Asian Language Speakers: Results From 15 Years of Operation in California"
This is the first study of a quitline serving Chinese, Korean, and Vietnamese speakers. It shows that Asian-language speaking smokers are just as likely to call a quitline as English-speaking smokers. "Current Major Depression Among Smokers Using a State Quitline"
Smokers calling quitlines are normally not assessed for depression, yet depression among smokers may influence their quitting. This study shows that nearly a quarter of smokers who called the Helpline met criteria for depression. "Quitline Utilization Rates of African-American and White Smokers: The California Experience"
This study compares use of the Helpline by African-American smokers and by white smokers. It shows that African-Americans were significantly more likely to call than white smokers. Promoting the Helpline as part of anti-smoking media campaigns can help reduce disparities in access to cessation services.